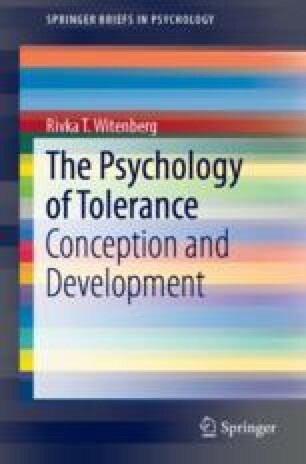 The starting point of the research presented in this book about tolerance to human diversity is based on the assumption that tolerance is not simply the absence of prejudice as much of the psychological literature into tolerance presupposes (Witenberg in J Moral Educ 36:433–451, 2007). Rather tolerance is a separate construct worthy of serious consideration in its own right both philosophically and psychologically (Vogt, Tolerance and education: learning to live with diversity and difference. Sage Publications, Thousand Oaks, 1997; Wainryb et al. in Child Dev 69(6):1541–1555, 1998; Witenberg in Racial tolerance and acceptance as the basis for harmonious living in a civil society, 2000b; Witenberg in Profiles of reflective racial tolerance and their relationship with justifications, 2002b; Witenberg in J Moral Educ 36:433–451, 2007). Dusche, M. (2002). Liberal tolerance between people(s). TRANS–Internet Journal for Culture Studies 5. Available online at: http://www.inst.at/trans/5Nr/dusche5.htm. Witenberg, R. T. (2000b). Do unto others: Towards understanding racial tolerance and acceptance. Journal of College and Character [On-Line], 1. Available online at: http://www.collegevalues.org.